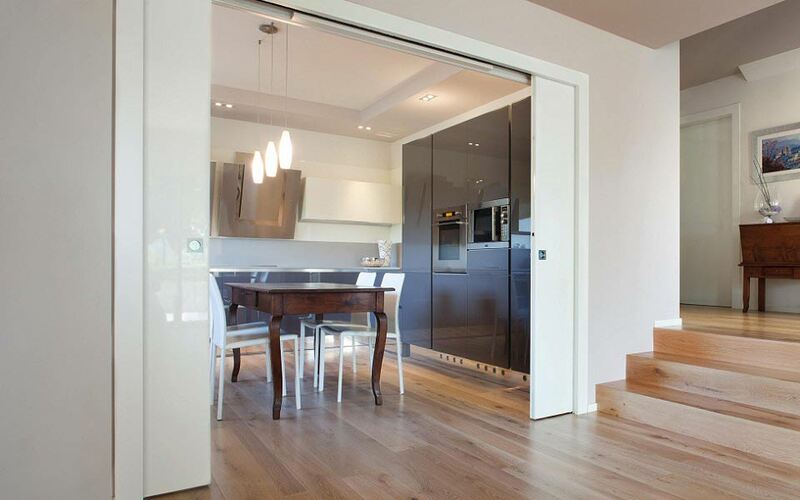 Perfect as room dividers for open plan spaces the telescopic pocket door systems provide you with the widest possible opening for the shortest wall space. A single telescopic pocket door system allows two door panels to slide back into the same pocket in the wall. Combine this with an Eclisse synchronization device and the doors will slide into the frame smoothly and simultaneously. • Wide range of sizes to suit standard UK door sizes. Bespoke sizes available. • Complete with full wooden jamb kit for a professional finish. • Maintenance-free track and runners. • Fully extractable track, no need to break into the wall should you ever want to remove it. • Fully adjustable front and rear doorstop. • Doors, plasterboard and final architrave not included. • Optional Synchronisation device. Coordinates the two doors travelling back into the same pocket. 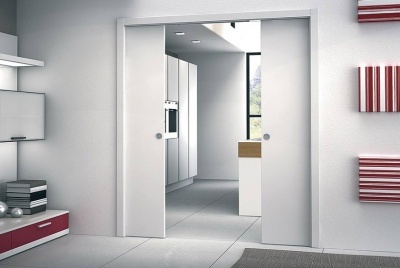 In 1989 Eclisse took the concept of the pocket door and redesigned it, registering 40 patents in the process. The Eclisse system is now sold in over 50 countries worldwide. The Eclisse pocket door systems are packed with innovative features to give the purchaser and installer peace of mind. Eclisse have created a pocket door system in kit form that assembles into a strong galvanised steel frame with integrated track. The smooth running gear inside the track has been independently tested to 100,000 open/close cycles which is more than 25 years of average use. Unlike its Victorian predecessor, this modern day technologically-advanced version of the pocket door is maintenance-free and comes with a 12 year guarantee on the galvanised steel frame and running gear. It is estimated that in an average home, more than 8% extra space can be released by the use of sliding pocket doors; that’s 8 square metres of extra space in a 100 square metre house. Pocket doors can now be found everywhere, in luxury hotels, stunning designer houses, practical self builds, commercial offices and affordable housing. Once you’ve installed a pocket door you’ll wonder why you ever used a hinged door. Eclisse UK are able to supply one of the largest ranges of pocket door systems you will find anywhere. Imagine opening up and closing off different areas of your layout in an instant, with doors that are there when you need them, and slide into the wall when you don’t. That’s the beauty of pocket doors! Because the doors slide into the wall, the doors themselves do not take up valuable space in the room when they are open, unlike traditional hinged doors. Eclisse’ range includes single and double pocket door systems, telescopic systems for a wider passage opening, circular pocket door systems and also pocket door systems with tempered glass doors that can be patterned, coloured or even hand painted with intricate designs. Their friendly customer service team will be more than happy to discuss your requirements and to talk through the product options. Eclisse regularly exhibit at Homebuilding & Renovating Show and other self-build exhibitions. Keep checking their website to see where we are exhibiting next. It is a great opportunity to see their full-sized demonstration models of: - Single Pocket Door Systems - Double Pocket Door Systems - Syntesis (Flush Wall) Pocket Door Systems - Pocket Door systems with Frameless Glass/Mirror Finish Doors The Eclisse team will be delighted to talk to you about how their range of door systems could add value to your build project... - Pocket doors to save space - Double pocket doors for room partitions and to create multi-functional spaces - Syntesis flush hinged and pocket doors for an elegant, contemporary, minimalist look - Frameless glass doors to save space and let the sun shine through everywhere in your house Whether you are just at the ideas and research stage or you have a full set of project plans with you, Eclisse would love to see you.